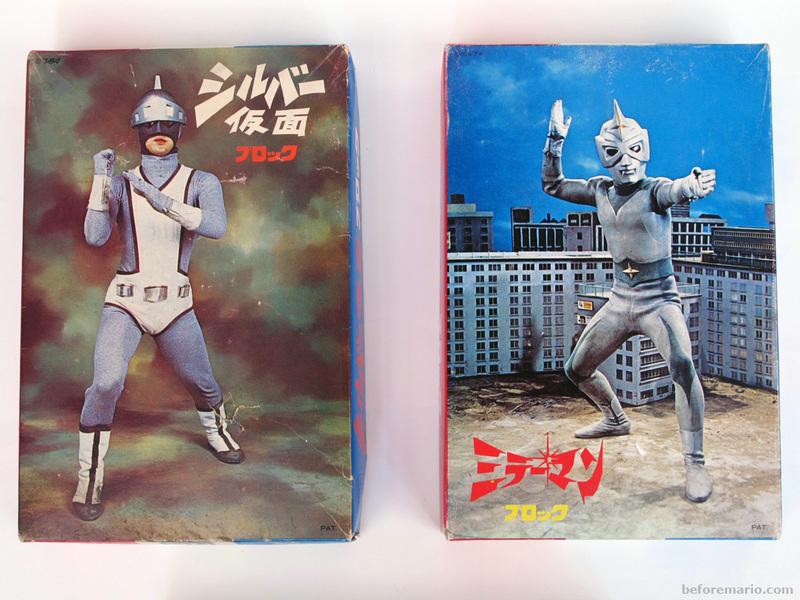 Today we will take a look at some of the coolest sets in the Nintendo Block N&B series: the Tokusatsu (特撮) range. 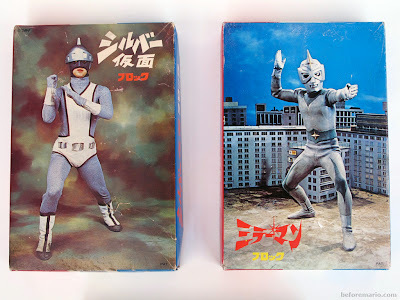 Tokusatsu is the genre of superhero and monster movies and television series, which were (and still are) extremely popular in Japan. 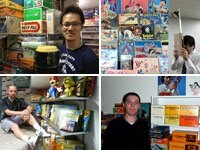 Nintendo acquired licenses to some of the most popular characters from these television shows, and used these in various toys, including these three N&B sets, featuring the Silver Kamen, the Kamen Rider and Mirror Man. (Other nice examples are these clocks). Although these sets do not have a clear year of release, they all feature characters from television series introduced in 1971, so it is safe to assume they were sold after this time. All three sets contain clear building instructions to create one of the three heroes. The first set we will take a closer look at is Nintendo Block Mirror Man (任天堂 ブロック ミラーマン). Nintendo Block set "Mirror Man"
The model number of this set is "NB 800-MM". It cost ¥800. The box contains the building constructions and a picture of the finished set. 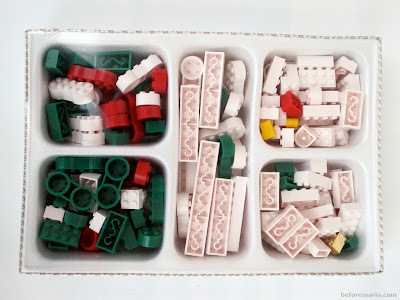 The set contains exactly all blocks required, so better not lose one! This set contains two special gold colored blocks, for Mirror Man's belt and cap. In a stroke of artistic license, his two-toned gray suit is translated into white and green here. Once assembled, you have an impressive looking 35 centimeter high superhero. Having your own Mirror Man allowed for fun replay of the episode you just watched on television (minus the explosions). The second set presented here is the one of the immensely popular Kamen Rider (仮面ライダー). 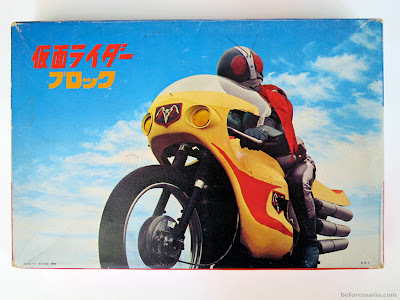 Nintendo Block set "Kamen Rider"
Super heroes, monsters, explosions, chases on fast bikes; the Kamen Rider television show had it all. The model number of Nintendo Block Kamen Rider (任天堂 ブロック 仮面ライダー) is "NB 800-K". It also cost ¥800. As the Kamen Rider would be lost without his bike, it is included in the set. Because part of the supplied blocks had to be used for the bike, this meant less blocks could go into the Kamen Rider itself. As a result, it stands somewhat less tall (27 centimeters) than its fellow super heroes from the two other sets. The set even includes a miniature version of the Kamen Rider signature scarf! The third and final set is Nintendo Block Silver Kamen (任天堂 ブロック シルバー仮面). Nintendo Block set "Silver Kamen"
This set had model number "NB 800-SK", and cost ¥800. Like the others, Silver Kamen is no hero to mess with. Deadly laser eyes! Does this Silver Kamen walk like an Egyptian? By the way, "Kamen" (仮面) means "masked". Which is what the Silver Kamen and Kamen Rider were. Silver Kamen is similar in size to Mirror Man: 35 centimeter tall. To wrap up this post, here's the law-and-order-enforcing bunch together. A full introduction to the Nintendo N&B Block series can be found here. Wow, great post, thanks for putting this up! Those sets are amazing! I definitely want one of those hero sets like Mirror Man, they look fantastic! I am really appreciating your efforts to properly photograph and present your wonderful collection, it's so interesting. Thanks. ps. I figured out the best way for me to just keep browsing was to view by date and then 'older / newer' rather than what I had been doing which was viewing from the 'list of toys and games' section. John, thanks for the comments. I appreciate the feedback. Will look into ways of further improving navigation of the content from within the individual posts. Kamen Rider indeed is really cool. 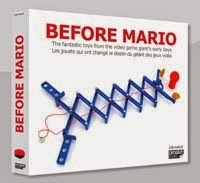 It is the most fun series of that era (and popular to this day).